- " Great mix of music and kept the floor full on the night we saw them at a wedding reception!" - " GREAT music covering many generations. something for everyone." - " We really enjoy you all coming to Lake Gaston Americamps!!!!" - "Dear Bo, I just wanted to personally thank you for a fabulous evening. You guys are GREAT! Everyone enjoyed the evening and especially the music. Thank you soooooo much. Fondly, Debbie Foster"
- " Awesome band. Great variety of music. 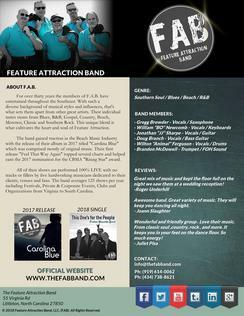 They will keep you dancing all night"
- "Dear Feature Attraction Band, - Thank you so much for traveling to Charlottesville for our wedding! We absolutely loved every minute of it! Our reception is an event we will look back on with such joy! Y'all played the best music and kept us dancing the night away! We can't wait to hear y'all again! We hope you had as much fun as we did! Thanks again, Taylor and Katelyn Myers"
I know it is a bit delayed but Brett and I wanted to thank you and the entire Feature Attraction Band for the phenomenal job you did at our wedding. Over the past few weeks we have received countless complements on how fun and energetic the event was and that is entirely attributed to you guys! We are happy to serve as a recommendation at any time. Again, we were so happy that the Feature Attraction Band was a part of our wedding! Cheers"
- "Had a great Saturday night at Watersview at Lake Gaston hearing your band for the first time and meeting your band members. For a band that hasn't been together but 2 years, it is unbelievable the sound and talent this band is packing. Thanks for a great evening Enjoyed having you guys play my 50th birthday party last night. - Brenda Ellis Coker"
All files located on this page are for promotional purposes ONLY and are inteded for use by our clients. Any duplication, modifications, or use without permission is strictly forbidden and any person(s) found using any materials, logos, artwork and any other material found on this website or any promotional websites, ie Reverb Nation, Facebook , Twitter and others without written consent from F.A.B. will be handled accordingly.